Rob and Stephen are exceptional strategists with decades of experience in continuing medical education (CME), digital media, data analytics in healthcare education, and outcomes-based education strategies. 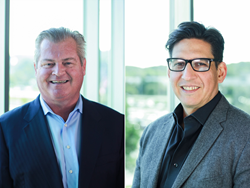 Prova Education, one of the nation’s fastest-growing medical education enterprises, announced the expansion of its education strategies team with the addition of industry leaders Rob McCarry and Stephen Chavez. They join Prova Education at a time of significant expansion in products and partnerships designed to change knowledge and skills in healthcare professionals. Rob McCarry joins Prova Education as Senior Director, Education Strategy, leveraging two decades of experience in the CME industry. Prior to joining Prova Education, Rob held numerous senior leadership positions in medical education, digital media, technology development, and publishing. Most recently, he was Executive Vice President for Integrity Continuing Education. Prior to Rob’s tenure at Integrity, he was Senior Vice President at Clinical Care Options and Executive Vice President and General Manager at Platform Q Health. Rob launched and oversaw the building of educational platforms in therapeutic areas including oncology, neurology, virology, rheumatology/immunology and diabetes/cardiometabolic diseases. Stephen Chavez joins Prova Education as Director, Education Strategy, leveraging two decades of experience in improving patient health outcomes through physician engagement and CME programs. Stephen co-founded Health Advocacy Partners, an organization that measures impact through patient education, digital health strategies, and patient-reported data collection and analysis. He was Vice President of Strategic Alliances at North American Center for Continuing Medical Education (NACCME), where he developed large-scale collaboratives that supported the health outcomes mission of partnering organizations. Stephen was a leader at Gullapalli & Associates, an agency-styled educational consulting firm leveraging collaborative partnerships to develop and implement educational grants. Prova Education delivers integrated, lifelong learning opportunities that lead to improvements in clinician competence and performance, with the aim of improving patient outcomes. Its multi-platform educational network includes live meetings, online activities, social media, radio broadcasts, print media, and more. Its global footprint includes educational endeavors and strategic partnerships in North America, South America, Europe, the Middle East, and Asia. More information is available at http://www.ProvaEducation.com.